Coping with Aggression is delivered over a full day. 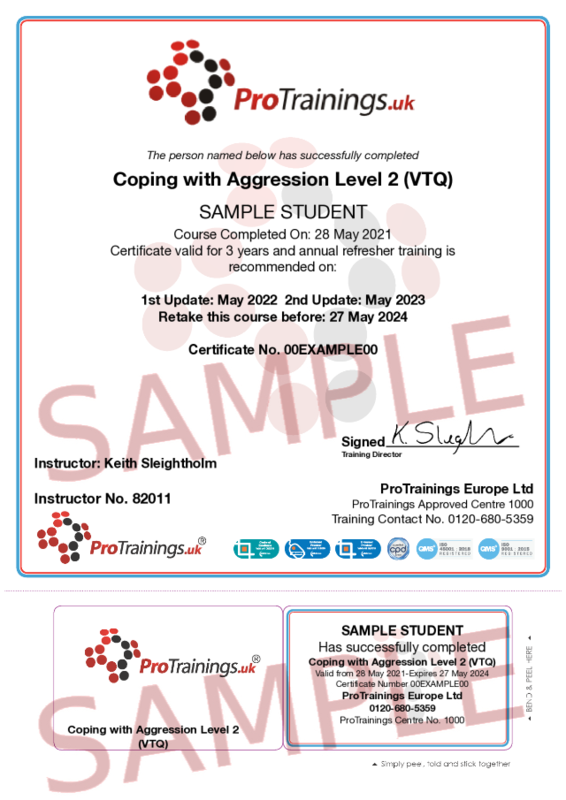 The course aims are to provide learners with an understanding of possible reasons behind the aggressive behaviour, briefly look at the legal implications of managing aggressive behaviour in a care setting, and teach possible strategies for managing aggressive behaviours. By the end of this session, candidates will be aware of what constitutes aggression; recognise the common signs of aggression, including body language and tone of voice; understand some of the common causes of aggression; understand and implement techniques to manage aggression in others; implement basic procedures for personal safety in the workplace and off-site; be aware of the importance of accurately and appropriately recording aggression; and have an understanding of the legal implications of aggression.